Increased security of desktops and their information. Get cost savings on hardware, maintenance, administration ... etc. It favors the delocalization of work, increasing the geographical distribution. Consistent access to the workplace from any device. Nologin gives you the tools you need to install your own virtual desktops. Virtual desktops allow you to maintain control of your growing business without restrictions of place, reducing ownership costs and streamlining processes in an environment in which everything must be continuously adapted or developed to suit new needs. 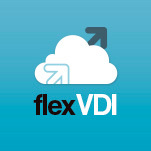 We work with the software of flexVDI in order to offer you the solution that best suits your virtualization needs. Please consult us with your business and growth needs, and we will offer you the best possible solution. As it’s own infrastructure, your data is kept as private as possible. It grants us full control of cloud management, its capabilities and the data it stores. Our private cloud offers us many possibilities. It all depends on what you want to implement. We manage your appearance, applications, behavior, organizational data, etc., and we can adapt it to our workflow.